Previously we mentioned about larger foot print Intel Atom processor with extended temperature support that being released to market, now seems that Portwell, a Taiwanese board maker has completed an actual prototype board based on Qseven form factor. Named as PQ7-M102XL, it can operate with wider operating temperature range suitable to be used in industrial, medical and even military applications. Qseven is a smaller form factor board design ideal for mobile device. 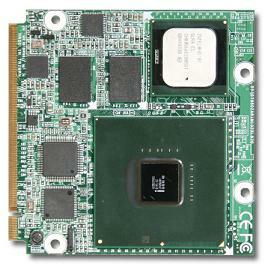 Measured at 70 square mm, it featured some high demand peripherals’ connectivity such as USB ports, Gigabit Ethernet interface, dual independent display through LVDS and SDVO video ports, as well as high bandwidth interfaces such as PCI Express and commonly available SATA (Serial ATA) for storage space. With its relatively larger processor and chipset pairing as compared to previous first generation Atom Z5XX series, it doesn’t increase the board size as much as you may anticipate. And in order to make the board compliant to stringent industry’s requirements, the Intel Atom Z510PT and Z520PT are built with internal heat spreader that allows them to maintain normal operation at a wider temperature range from -40 to 85 degree Celsius without the need of complicated power management system. No information on availability and pricing yet, the platform is expected to be run well with Windows XP Embedded, Windows CE and Linux Operating Systems.